Meebo is one of the best multi-protocol web-based instant messaging client on the market. For various reasons, there are cases where access to Meebo is restricted. Meebo Repeater is an official application that configures the web settings allowing you to access Meebo whenever it is blocked. This open source software "bounces" your Web traffic from one computer to another, and finally to Meebo's servers. 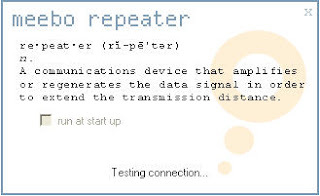 Just install the repeater on a computer that can access the Web freely, and then use that computer to bounce the signal to Meebo.